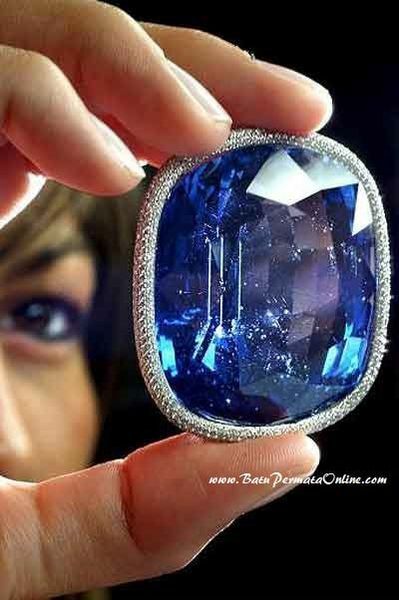 The largest sapphire in the world was discovered in Sri Lanka in 1907. The sapphire was dubbed the "Sapphire Blue Giant of Orient". 466 carats of Ceylon Sapphire with the best quality. Can you imagine how high the price is. This sapphire originating from Sri Lanka, it has a strong orange red fluorescence under ultraviolet light with a longer wavelength. In the world only found in Sri Lanka for the best Sapphire, which is then decorated with a collection of museums and exhibitions throughout the world. Sapphire in Sri Lanka, the king's offer and then sold at auction at fantastic prices. If we talk about blue sapphire as a whole, as a corundum, an aluminum oxide crystal, where blue is caused by titanium and iron atoms, which replace aluminum atoms in the crystal lattice of certain places. Blue Sapphire is considered a precious stone of all types of Sapphire. Maybe this is one of the most interesting parts of our story about the world's largest blue sapphire. Like most corundum minerals, blue sapphire is deep underground for at least five hundred years, and possibly and more. Sapphire is born in magma, where the temperature and pressure are high. In 2007, the year in Madagascar, Antananarivo University, presented the results of a study showing that rubies and sapphires were formed under very high pressure and at temperatures around 1100 degrees Celsius. The depth to the surface of the earth is at least 60 kilometers, and the upper mantle is lower than the lithosphere. Aluminum oxide forms in the upper mantle of the earth, where it also creates basaltic magma. The eruption of basaltic magma is brought to the surface, where it forms volcanic rocks. Some volcanic rocks are converted into metamorphic or basal alkaline rocks. Then alkaline basalt and metamorphic rocks that have long erosion for millions and maybe billions of years and. All of this causes the formation of the crystal corundum to be released from the rock and creeping down the mountain. Stored in the form of alluvial placers in the foothills of the mountains. Or streamed by the river and now mined. The giant Sapphire was found at the foot of the mountains of Adam's peak, which is part of a plateau in the central southern part of Sri Lanka. The river, where they found the Sapphire, is called Kalu Ganga, and has its origins at the peak of Adam; past the outskirts of Ratnapura, which is also called the noble city, because this place is the largest deposit of rubies and sapphires since ancient times. Most famous big sapphires come from the region, including the "Sapphire Blue Giant of Orient". History of the world's largest blue Sapphire "Sapphire Blue Giant of Orient"
For the first time information about precious sapphires appeared in 1907 on August 23, while the leading Sri Lankan newspaper "Morning Leader" wrote headlines here on sapphires, "Sapphire Jewel is worth £ 7,000." The giant Blue Sapphire from the Orient was mined in the Ratnapura district, probably in 1907, because the news in the paper was only this year. Reducing the size of a previously rough blue sapphire that weighs 600 carats, stone is the leading dig for buying Sri Lankan jewelry and precious stones. Then the company has instructed its leading faceted sapphire employees. After the Blue Giant left Timor Sri Lanka, he was in an anonymous collection of American collectors. About Sapphire, it was discovered until May 19, 2004, it was then at Christie in Geneva, Switzerland, that it was for sale. Press displays were held earlier, on May 12 in 2004. Sapphire was described as a rectangular gemstone diamond pillow weighing 486.52 carats and worth 1 or 1.5 million US dollars. So there are two inaccuracies in the sale of sapphire 2004 at Christie, compared to the real gems of the Blue Giant from the Orient. The first is a description of Kashmir sapphire as, while the original stone is Ceylon origin. But maybe the description does so because of the high value of the saturated colors of sapphires from Kashmir. 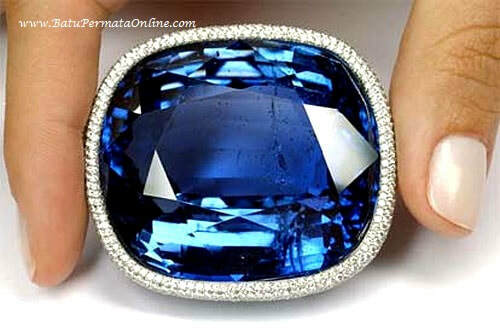 It is believed that the auction in a special called Kashmir sapphire Christie to increase its value. The second inaccuracy is that the Giant Blue of the Orient weighs 20 carats less than the precious sapphire sold at auction at Christie. In 1907, it was noted that sapphires were treated with a weight of 466 carats and sapphires at auction weighing 486.52 carats. This difference is explained that in 1907 made a mistake in recording the weight of the Sapphire. Allegedly, there is an accurate electronic scale, and the stone can properly weigh.